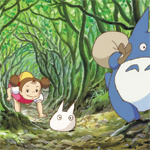 The day Ponyo was released on Blu-ray, three other Miyazaki features were also re-released on new DVD editions. And while My Neighbor Totoro looks and sounds the same as its DVD predecessor, Castle in the Sky and Kiki’s Delivery Service look much better. If you buy all three of these DVDs (four if you count Ponyo), you will notice some similarities. The menus all have the same look, and the new extra features fit into many of the same categories. For example, they all have a segment on the locations that inspired Miyazaki. There was a Japanese TV program on the subject, and it is broken into pieces, each piece relevant to the DVD it’s on. So we learn that Kiki’s new town is based on Stockholm and Visby, both in Sweden. The summer home near the Totoros is a place an hour outside of Tokyo where Miyazaki spent some time. Most of the extra features are only a few minutes long. Miyazki is interviewed about characters or production issues specific to the DVD. Producer Toshio Suzuki talks about making the movie. All 4 discs have exactly the same segment about composer Joe Hisaishi. In addition, the DVDs include the extra features from the previous DVD release: “Behind the microphone,” about the English-language adaptation, and storyboards. I was surprised to discover in a head-to-head comparison that the picture quality on the new DVD release seemed much cleaner than on the previous release. The box mentions a “remastered” audio track (I couldn’t hear a difference), but it makes no mention of the picture quality. Yet especially around lettering or in areas with lots of tiny detail, the picture is notably crisper and less noisy. I didn’t notice a picture quality difference between the previous DVD of Totoro and the new one. One of the best improvements is that the menus show your options right away; no waiting for the cute little cut scene to finish. Of the new DVDs, this one probably has the most interesting and relevant extra features. It has the interview segments that really cut to the heart of why I love Miyazaki’s films. He spoke of working on a TV show and wanting to do something different. He wanted to set the story in the 1950s, before TV dominated our lives. “Back then movies about were guns, action, speed, I wanted my movie to be peaceful, tranquil, and innocent,” he says. Indeed, it’s hard to name a filmmaker whose dramatic conflicts are so simple and peaceful, yet still human and relevant: finding meaningful work, looking after your little sister, worrying about a sick loved one, fitting in to a new community. This DVD is probably the most different from its predecessor. Not only is the picture quality noticeably better, but the audio track is back closer to the original Japanese release. In the previous DVD release, the U.S. version had new songs and new symphonic music in addition to a new dialogue track. Instead of a 1950s sock hop theme, there was a power-country “you go girl” anthem. The new U.S. release reincorporates the music from the Japanese track under the American dialogue. There is one other welcome change: Jiji the cat does less sass-talking. Some of Phil Hartman’s filler lines have been removed so that it’s more in line with what Japanese audiences saw. On the original DVD release, you couldn’t change from English to Japanese on the fly, and I am guessing that’s because two entire versions of the movie were encoded on the DVD. You can tell over the beginning and end credits that the movie itself — not just the audio — was different. On the new release, you can switch between languages at will. If you can’t wait for Blu-ray, then Kiki and Castle are worth upgrading because of the picture quality. Totoro has the best extra features but could be rented instead of bought. Watch just one at a time followed immediately by the extra features, which are short enough to fit into one sitting.